That's right folks, its ADOT's Second Anniversary today! !, phew two full times the earth went around the sun that is. Okay enough of that, Two years ago before I began my journey as a food blogger, the idea of making something exotic like a three layered frosted cake for a loved ones birthday or a from scratch biryani for a party of six were only distant dreams, things I often thought of but never quite had the courage to execute. This blog has not only widened my horizons but has constantly made me push the envelope in more ways than one. I often mention this in my posts and will do so today too, that in addition to the clicks, likes, shares and comments from my readers, what I truly value are all the lovely friends I've made along the way, you all know who you are and I want to take this opportunity to thank each one of you lovely ladies for being my friends, you guys make blogging a true joy for me. Now though I've always loved inventing my own recipes, something that I've always stayed away from was preparing pilafs (pulao's) and biryanis. 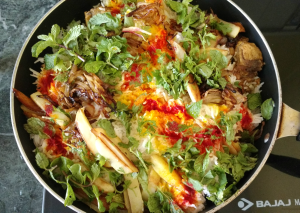 The former because my pilafs always ended up turning mushy and the sheer steps and ingredients in any biryani scared the living day lights out of me. Then one day I started this blog and every thing changed. My better half a true blue rice lover dared me to make him a huge pot of biryani and the wife would have wiggled her way out but the blogger just couldn't pass up the challenge. 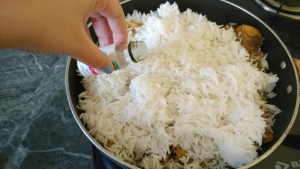 Now like me I know how a lot of others are scared of making biryani too and since I found no solution from the world wide web I thought of putting together recipes myself and document them in easy steps for newbies like me. 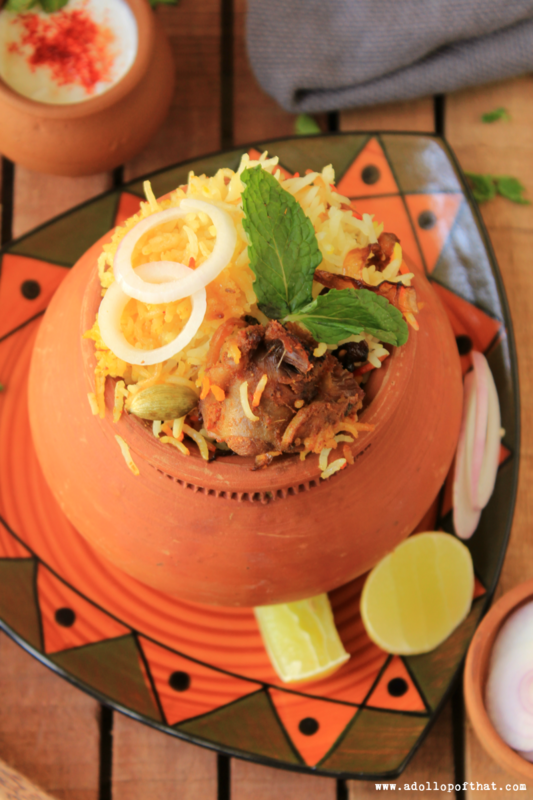 Today on ADOT's second birthday I share a simple recipe for Mutton Biryani for it reminds me of happy days spent rejoicing with friends, cousins and colleagues and a birthday is a happy occasion isn't it? 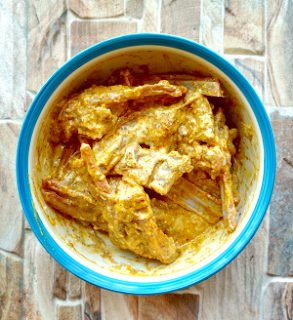 1) Take washed mutton in a bowl and add ginger garlic paste, 1 tbsp red chilli powder, 1/4 tsp turmeric powder and salt to taste also add 1 cup of yogurt, a handful of mint leaves, a handful of coriander leaves(washed) 1 tbsp biryani masala and mix well. Now in add 1 bay leaf, cloves, green cardamoms, black cardamom, cinnamon stick, shahi jeera, half lime juice and green chillies mix all of these well also add 1/2 tbsp desi ghee and mix well. 2) Allow this marinade to sit overnight in the refrigerator. 4) Take them out on an absorbent or tissue paper and continue to deep fry the remaining. 5) Once all the onions have been fried, remove into a box and refrigerate. 1) The next day wash 2 cups of basmati long grain rice and soaked them in water for half an hour, then drain them. 2) In a large pan let water boil and add salt (if salt isn't adequate here, the biryani won't taste good). 3) Add 1 tbsp oil, let it boil again and add the rice along with 1 bay leaf, shahi jeera, cloves and green cardamoms, stir well. 4) When the water boils and the rice are half done, drain out the water and add 1/4 tsp saffron strands soaked in 1 tbsp warm milk and set it aside. 7) Now add in the remaining fried onions along with 1/4 cup of melted desi ghee. 8) Cover your pot with a tight lid to make sure no steam escapes. 9) Cook on a medium-high flame for 20 minutes. 10) After 20 minutes cook it on a low flame for 30 minutes, make sure once again that the lid is sealed off properly and there's no way any steam will escape so that the mutton infuses with the aromas and cooks well. 11) Switch off the flame after cooking for 30-40 minutes, now open the lid and check! Serve hot and garnish with dry fruits and boiled eggs. 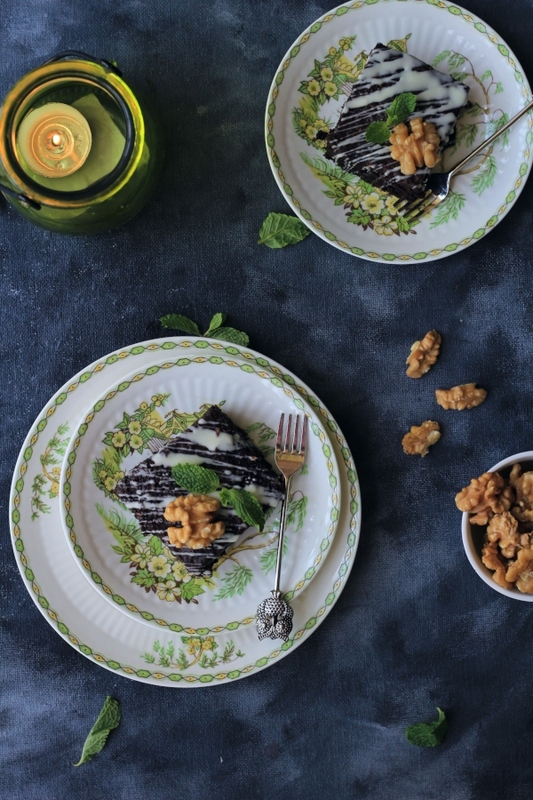 Happy blogiversary, Parinaaz! 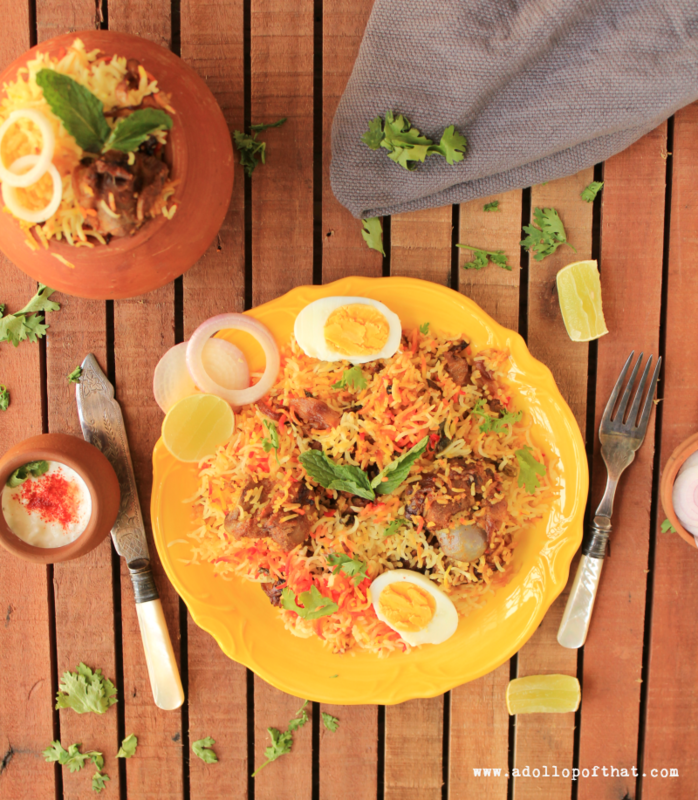 I can imagine how flavorful and aromatic this biryani is!! Yum Yum! Congratulations on completing a big mile stone. It is a great journey indeed. This biryani is quite different to what i normally cook. I have to try this method. Thank you.